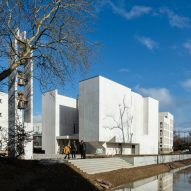 Portuguese architect Álvaro Siza Vieira has completed a church in the Brittany region of France, featuring a sculptural composition of intersecting concrete forms. 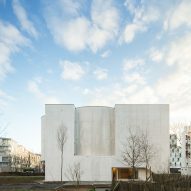 The church of Saint-Jacques-de-la-Lande is the first to be built in Brittany in the 21st century, and was designed by Siza's Porto-based office to complement its setting in a residential neighbourhood south of Rennes. 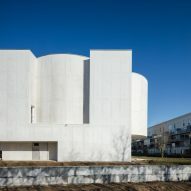 "The church is inserted as a free-standing volume that adapts to the existing plan and the dimensions of the nearby buildings and spaces, extant or planned, and particularly the size of the apartment block to the north," said a statement from the architects. 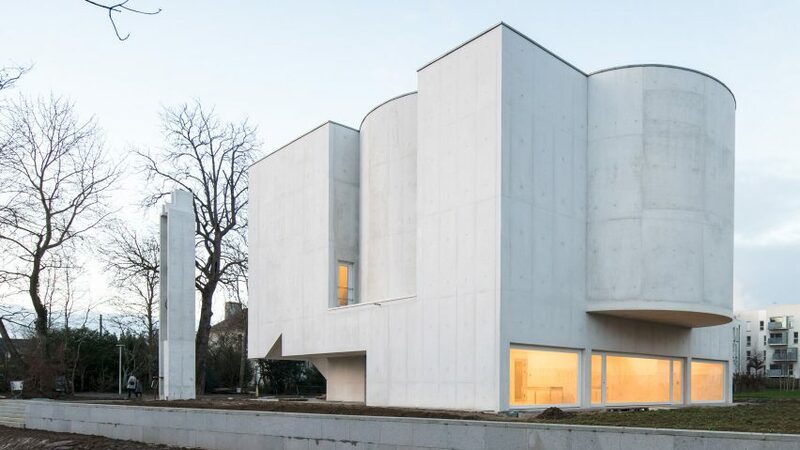 A white concrete exterior echoes the appearance of other buildings in the area, while the use of crisply rendered geometric volumes is a motif Siza has turned to throughout his lengthy career. 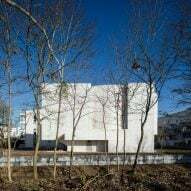 The 84-year-old Pritzker Prize winner is renowned for his poetic approach to modernism, which he has applied to projects including the Nadir Afonso Foundation in Portugal and the Ibere Camargo Foundation in Brazil. 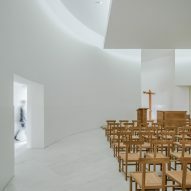 The church's programme is distributed across two levels, with a cylindrical volume at the centre of the upper floor, accommodating a church hall for 120 people. Administrative and social spaces, including a parish centre, are housed on the ground floor. 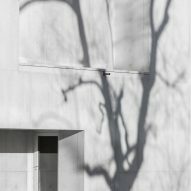 This is entered through glazed doors, incorporated beneath a protruding canopy at one end of the building. 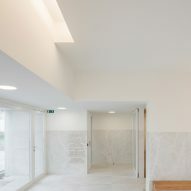 The entrance atrium is flanked by a pair of rectangular volumes that extend the full height of the building. 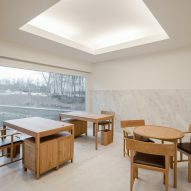 Two identical forms create corners at the opposite end, on either side of a half cylinder that cantilevers from the upper floor. 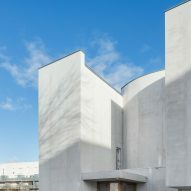 The rectangular shapes intersect with the central cylinder containing the church hall, creating nooks around the perimeter that perform various functional roles. One of the corners to the front of the building contains the main staircase, while the other accommodates a second enclosed stairwell and a lift leading to a private sacristy overlooking the main hall. 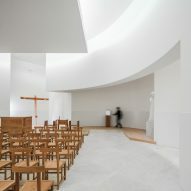 The semi-circular apse accommodates a statue of the Virgin Mary and the tabernacle, while a baptismal font is housed in a side chapel located in another corner. 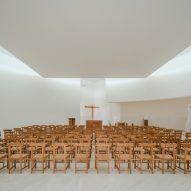 The crucifix is positioned in a chapel diagonally opposite the main staircase, which determines the axis of the congregation area and the orientation of the rows of custom-made seats. 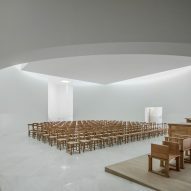 "A square platform is suspended above the cylindrical space of the church to control the light entering through the clerestory and hold the lighting and ventilation equipment," the studio added. "The sides of this square panel are parallel to the axis of the congregation zone. The church is thus lit from above and indirectly, reflecting off the ceiling and the cylindrical walls." 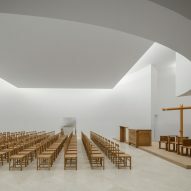 Two further clerestory windows above the image of the Virgin Mary and the baptismal font direct light into these spaces. 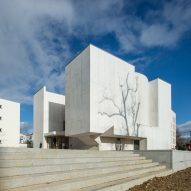 The building's load-bearing walls are made from insulated white reinforced concrete, and display markings from the formwork used when they were cast on the facades. 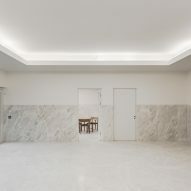 The floors inside the parish centre and church are paved with marble that extends onto the walls, forming a datum around the rooms and introducing a tactile element to complement the wooden furniture. 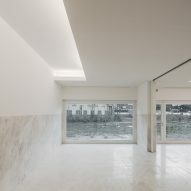 Siza, 84, is one of Portugal's best-known architects, known for projects such as the Boa Nova Tea House and the Santa Maria Church. 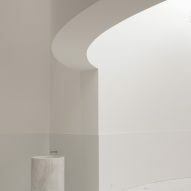 In an interview with Dezeen in 2014, he said that "emotion is very important" in his architecture.